With Hamilton Beach Single Serve Coffee Makers you are in control of when and where you can get your espresso coffee fix. Single serve coffee makers have become very popular in today’s society. Blame it on our ongoing need for instant gratification, fast and quick service, in just about every area of our lives; but especially in coffee – because when we need a pick me up, we want our espresso coffee as quickly as possible! Coffee makers at home allow us to have great tasting coffee without having to mindlessly wait in long queues. With single serve coffee makers you are in control of when and where you can get your espresso coffee fix. Hamilton Beach designed this product, constructed of durable stainless steel, to be easy to use. All you basically have to do is scoop you preferred coffee grounds into the unit, place the coffee mug or travel mug you want filled in the stand and let it brew. The stainless steel mesh scoop acts as the filter and fresh coffee is brewed in under a minute and-a-half for an 8-ounce mug and under two-and-a-half minutes for a 14-ounce travel mug. In addition to the ease of use, Hamilton Beach designed the drip tray on the base to be wide so it can double as a spill-resistant drain in the case of too much coffee pouring out. There are also two different settings (regular and bold) and after brewing the unit automatically shuts off. So once your coffee is ready you can race out the door with nothing more to do. Online reviews of this single serve coffee maker are positive and favorable. Even skeptics are sold on the quality of the brew once tested using words such as “full bodied,” “rich” and “flavorful” to describe the brewed results. The design of the Hamilton Beach 49981A earns much praise with the deep and handy coffee scoop and easy to fill water reservoir receiving specific mentions. The fast brewing time and indicator lights are also features that are enjoyed by users of this product. Other users favor the small single serve coffee maker; liking that it does not take up your entire kitchen counter. They like the stainless steel and black construction design stating that it is a stylish espresso coffee machine to have in any home or office. Many reviewers comment on the fact that it is so easy to clean; there is little – if any – waste to throw in the trash. This is because this coffee machine does not require paper filters, you just use the wire basket provided; making it an environmentally conscious choice. Is the Hamilton Beach 49981A for you? 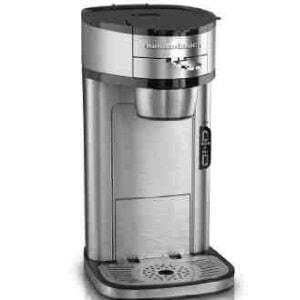 Hamilton Beach has a long history of producing quality products in the coffee and tea department. The 49981A Single Serve Scoop Coffee Maker utilizes a sleek design, stainless steel construction and quick brewing times to its advantage. Add to that it’s speedy delivery, producing a hot and perfectly brewed coffee in less than two minutes (for an 8-ounce mug) and you have a winner on your hands for people on the go. Other online reviews agree with our findings that verify all claims made by the manufacturer and describe this machine as a welcome addition to any home as it is easy to clean and produces little in the way of garbage other than used coffee grinds. If you are looking for a single serve coffee maker, this is one of the best available on the market.